New construction is occurring new the corner of Arlington Blvd. and N. Nash St. in Rosslyn. 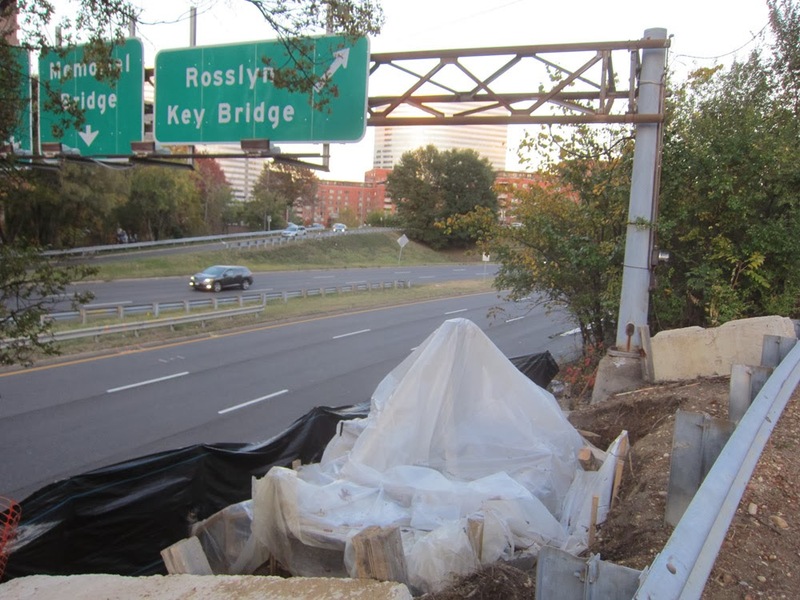 The Ode Street Tribune's investigative reporter speculates that the Virginia Department of Transportation (VDOT) is planning to construct a eastbound digital sign to complement the westbound digital sign that obscures a beautiful view of Rosslyn and provides unimportant information. Many drivers pass though Rosslyn on Rt. 50 without knowing what they are missing. The Ode Street Tribune demands that any new sign constructed in Rosslyn along Rt. 50 pay homage to Rosslyn artistic, creative sensibility. It should encourage drivers to exit their usual thoroughfare and explore Rosslyn. Perhaps the sign could include some colored-yarn-like decoration or luminous bodies of light. Plain black steel pipe should be unthinkable.